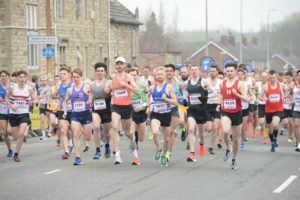 The Lincoln 10k has established itself as one of the biggest and best-loved road runs in the region. With super support all around the route, a great goody bag and T-Shirt, thousands rock up and run every year. Its fantastic, flat and fast course is perfect for seasoned runners chasing a PB, fancy dressed fundraisers just hoping to get round and beginners looking for a fun and friendly first run. The race was won by Lucian Allison of Lincoln in a time of 29:28, first lady was Abbie Donnelly in 34:30. Our only Strider was Ronan Charlton in a time of 36:30.